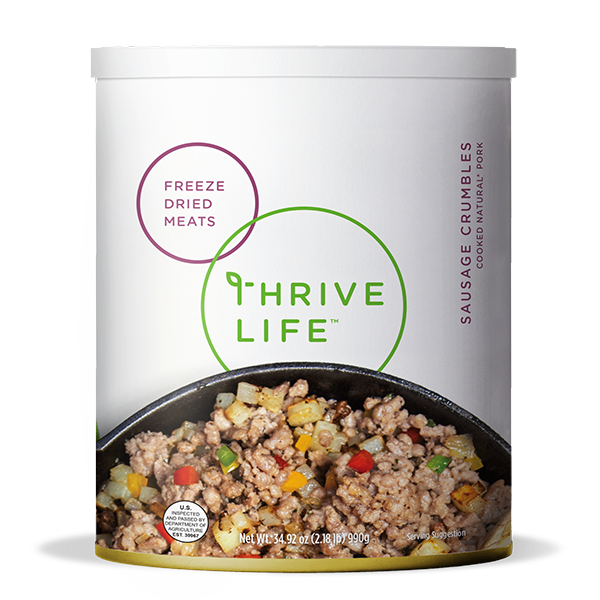 Thrive Sausage Crumbles are a sure crowd-pleaser in hash browns and scrambled eggs. Add these pre-cooked crumbles into cheesy casseroles or your favorite spaghetti sauce for added protein and taste. Add 1/4 cup warm water to 1 cup Sausage Crumbles; cover and let sit for 15-20 minutes, or until tender. Sprinkle it into sauces, soups, or omelets. No homemade pizza is complete without it! Like Ground Beef, Sausage Crumbles can be toasted for extra flavor by warming them in a pan with a little butter before adding the recipe's liquid content.